THE OLDEST FOSSIL EVER FOUND ON EARTH! This is a very special piece of the Earth's history. 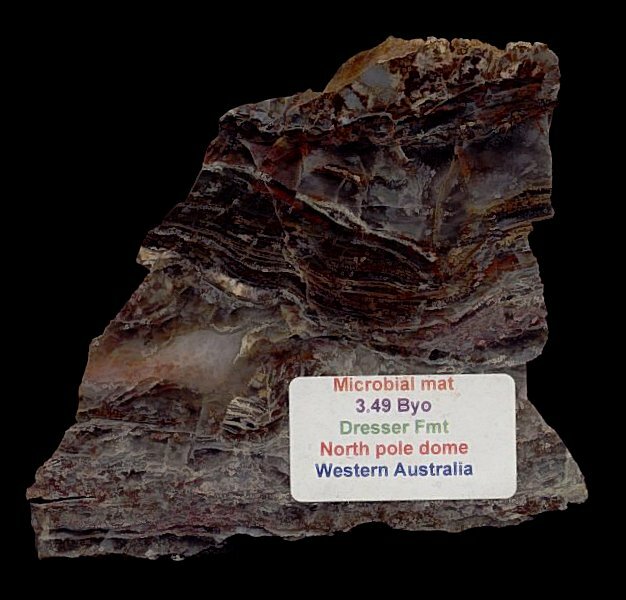 It is a large Microbial Mass stromatolite from the Precambrian of Australia. Authorities believe that stromatolites were formed by masses of green or blue-green algae, or ''cyanobacteria''. It has been established that this ancient stromatolite is 3.49 billion years old - IT IS THE OLDEST FOSSIL EVER FOUND ON EARTH! The unique layering pattern of the stromatolite is beautifully showcased, and the different shades of the distinct mineral replacement are quite striking. And, remember, this is not only a very, very old fossil, it is THE OLDEST FOSSIL EVER FOUND ON RECORD! You can't get much cooler than that!